Today's commonly used solvent-based extraction techniques fall into two general categories; hydrocarbon and CO2. This article is intended to provide details about both extraction technologies as well as a comparison of the techniques and technologies used in the extractions to help people understand key differences. Extractions falling into the hydrocarbon category are most popularly conducted using either butane or propane as a solvent. Here I will describe butane extractions, however, the details of hydrocarbon extraction using propane are quite similar. Please note that this text is descriptive only and is meant for educational purposes. It is not an endorsement of illegal activity. Please observe all laws in your state. Extracting essential oils using any hydrocarbon is extremely dangerous and in many states illegal unless performed in a licensed facility. BHO is an acronym referring to a form of cannabis extraction that has become popular in the past decade and involves the use of butane as a solvent. Other commonly used hydrocarbon solvents are propane and hexane. BHO extraction is cheap and easy on a small scale and is widely practiced. Consequently, it is a type of solvent extraction people are more likely to be familiar with, and they are more likely to have consumed a butane extracted product. Butane, a powerful solvent, is inexpensive and readily available in small containers. As a solvent, butane quickly strips cannabis plant material of its desired oils. Consequently, butane extraction efficiencies are considered to be high. Performing a BHO extraction on a small scale consists of packing dried cannabis into a glass tube about the diameter of the grip of a tennis racket. It's typical that 1-2 ounces of dried cannabis would fit into the tube. The tube has a small hole at one end and is flared open at the opposite end. A filter is fitted to the flared end to prevent the cannabis from washing out of the tube when the butane is injected. The butane canister's nozzle is inserted into the hole of the glass tube and the butane is injected by pressing down. The butane in liquid form, quickly fills the glass tube and after a minute or two, streams out the bottom of the tube through the filter into a glass dish. It is typical for more than one can of butane to be dispensed thru the tube of plant material for a complete extraction of desired oils. Following injection of the butane and its passing through your plant material in the glass tube, you will have a liquid butane solution containing high potency cannabis oil. The liquid butane bubbles in the collection dish and is extremely volatile. Liquid butane at atmospheric pressures will evaporate quickly. The fumes are more dense than air and will tend to collect in low areas of any enclosed space in which the evaporation is taking place. For this reason extreme caution is recommended. It is typical for small scale BHO extractions such as described here to be performed outdoors to avoid hazards associated with the fumes produced in evaporating liquid butane. Liquid butane will be allowed to evaporate from your solution. Depending on temperature and humidity conditions, simple evaporation can take several days and can span a week or more. When the majority of the butane has evaporated you will have a sticky, honey-colored extract in the glass collection dish. The extract will contain some trapped butane that will be in liquid and/or gaseous form. Further purging of butane from your extract is now necessary to allow the extract to achieve desired consistencies but also because you would not want to have residual butane in any end product. The objective then is to purge any remaining butane solvent from the extract as completely as possible and doing so requires the use of a vacuum drying oven. A vacuum drying oven precisely heats the extract under vacuum conditions enabling volatiles to be vaporized at lower temperatures. Vacuum purging BHO extract requires skill and patience. The duration of a complete purge is generally measured in days and commonly takes 3 days or more. During the vacuum purge process temperatures and pressures need to be closely monitored and adjusted to insure a desired outcome. Because temperatures are kept low throughout the entire BHO extraction process, terpene retention of the end product tends to be very good resulting in flavorful products. Small scale BHO extractions are commonly performed today because the equipment is inexpensive and easy to obtain and can be utilized with smaller quantities of plant material. Any process involving the use of compressed flammable gases poses significant safety risks. People performing these extractions put themselves at risk, and indeed have accidents, and in doing so give BHO extractions a bad reputation. Additionally, small scale BHO end products are unlikely to be subject to lab analytical testing and can potentially contain unwanted and toxic contaminants. Awareness is growing of the hazards associated with unregulated BHO extractions and the resulting end products. Larger scale, commercial BHO extractions will likely operate within a state-licensed entity and therefore subject to rigorous mandated safety protocols with the resulting BHO end products also strictly tested for residual contaminants. As with smaller scale BHO extraction equipment, the larger scale BHO equipment is less expensive than equivalent CO2 equipment. Equipment costs can be as little as 20% of the cost of CO2 equipment. However, the expense your facility setup should also be considered. BHO operations will require an isolated room or dedicated building within your facility that are explosion proof. Requirements typically include explosion proof appliances, switches, and ability to evacuate the space in a prescribed period of time - integrated with an alarm system. The cost of this type of facility is considerable. Ability to obtain a license to operate a BHO extraction facility within your state as well as ongoing regulatory compliance costs should also be taken into account when doing a cost comparison with CO2. The winterization or filtering process that is commonly performed with CO2 extracts is unnecessary with butane extractions. This works both ways however - on the one hand the spectrum of compounds butane pulls is largely desirable, butane extractions lack the selectivity offered with CO2 extractions. Butane extraction is binary - the hydrocarbon solvent will always extract from your source material a predictable spectrum of plant compounds each time you run an extraction. There are no extraction parameters that can be adjusted to alter the outcome of what is extracted from the plant material. You can extract more oil or less oil when you extract but that is going to be driven by the qualities of the source material and/or how much solvent you run through the material as opposed to than any other factors. Products made that are conducive to BHO process include dabbing oil, shatter, crumble, honey comb and myriad infused products. The object of many BHO practitioners is to produce shatter as an end product of their extractions. Shatter is a translucent substance that is high in percentage of THC and can be hard almost like hard candy. Shatter is consumed using a water pipe fitted with a special burning device also known as a "dab rig". Some vape pens are equipped with ceramic heating elements that can be used for burning/consuming shatter. The spectrum of plant compounds obtained with butane extractions are conducive to the manufacturing shatter as an end product. Which is great if you are in the business of creating shatter. Shatter has its fans, and really high quality shatter is a coveted commodity in the market place. But shatter is by no means an end product with mass appeal nor will its appeal ever transcend its place, and rightfully so, as a heavy stoner product. It is a stretch to consider shatter a suitable product for the medicinal market. I am sure some demand for high quality shatter will always exist but if you build your business around making shatter you will never serve more than a small niche in the cannabis market. CO2 extractions enjoy a well deserved reputation for utilizing technologies generally regarded as safe, employing a solvent which itself is naturally occurring all while creating a safer extract for use in products for the consumer market. CO2 extraction technology allows you precise control over temperature and pressure, those two parameters in turn control the state of the CO2 within the extractor whether it be a gas, a liquid, or supercritical - and the state of the CO2 dictates its solvating power. The supercritical state of CO2 is achieved at pressure and temperature combinations at and above 1080 PSI and 88° F. In the supercritical state CO2 takes on properties of both a liquid and a gas, becomes a super solvent and extraction times are relatively fast. There are many applications for extracting using supercritical parameters. In general however, cannabis extractions are best done using subcritical parameters; slightly lower pressure and temperature than supercritical, in which CO2 exists in a liquid state. It generally takes longer to complete extractions with subcritical parameters as supercritical CO2 is a stronger solvent. 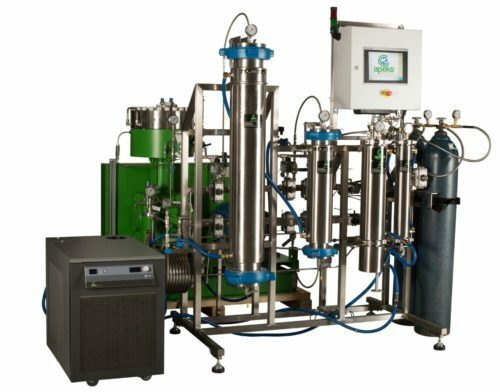 To extract cannabis oil using CO2, dried and chopped cannabis is placed in the extraction chamber of a closed loop, continuous flow CO2 extraction machine. Gaseous CO2, adjusted to exact temperature and pressure, undergoes a phase change transitioning from gas to liquid form and is then continuously flowed thru the cannabis. Being an efficient nonpolar solvent, the liquid CO2 pulls cannabis's essential oils into suspension. The oil-laden liquid CO2 then enters primary and secondary separation vessels where a reduction in pressure allows the CO2 to return to its gaseous phase and the cannabis oil falls out of suspension. The gaseous CO2, now devoid of cannabis oil, is repressurized returning to a liquid state and flowing back through the extraction chamber pulling additional oil from the cannabis. This continuous flow processing will run anywhere from 4 to 48 hours depending on the amount of material you are processing, machine efficiency, and your run parameters. "Cold separation" in CO2 extractions allow flavors to be preserved. CO2 extraction equipment manufacturers and Apeks in particular stress the importance of keeping temperatures within the extractor below 78° F during extractions. This factor is critical in preserving inherent flavors present in your source material. Supercritical extractions will typically process 1 pound of source material per hour. When running subcritical extractions allow 2-3 hours of processing time per pound of source material. A good rule of thumb for extractor vessel capacity is one half to three quarters of a pound of source material per liter of extractor volume. 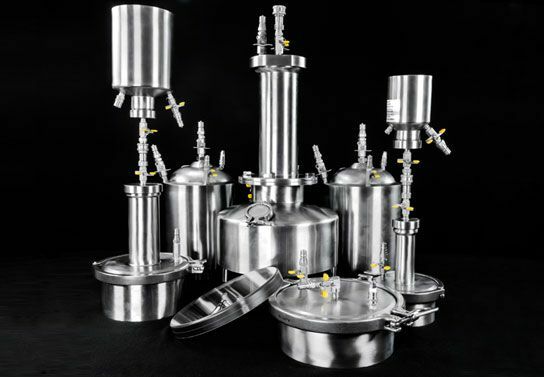 CO2 extraction machines typically feature extractor vessels in 5 and 20 liter capacities. The machines can also be configured with multiple extractor vessels, for example 2 five liter vessels or 2 twenty liter vessels. Varying consistencies of oils are pulled from the plant material throughout the extraction. Thinner, lighter oils that are terpene-rich are pulled early in the extraction because they are more soluble. Further into the extraction heavier oils and waxes are pulled. The longer you run the extraction the more oils and plant waxes are pulled from the plant material but there is a point of diminishing returns. Length of your run will depend on many factors including quality and quantity of plant material available to extract. Example, if you have an abundance of high quality material to extract, machine time is your limiting factor and you would therefore tend toward shorter extractions because longer runs are not an efficient use of extractor machine time. Conversely, if your supply of available plant material is constrained, then that's your limit and it would make sense under those conditions to utilize longer extraction run times. In some instances it makes sense to decarboxylate your source material before extracting. In decarboxylated plant material, some of the more volatile oils have evaporated off and the oil that remains is more soluble. Your extractions can therefore more efficiently extract the oils and your runtimes can be reduced by approximately 25%. It is generally considered better economics to spend the energy and time to decarboxlyate your source material in preprocess to achieve a reduction in extraction run times. There are times in which it would be undesirable to decarboxylate your source material before extracting. An example of this would be when your end goal is to produce shatter. Your extract must contain unconverted THC (i.e. THCA) in order to achieve the hard tack shatter consistency therefore you would not use decarboxylated source material. By adjusting temperature and pressure parameters you can achieve a broad range of selectivities in your extractions. You can set temperature and pressure to be constant throughout the extraction and you can adjust extraction parameters while the extraction is under way. The CO2 extraction system should be equipped with a secondary separation vessel (described above), allowing temporary diversion of the CO2 flow circumventing the primary separator and facilitating the harvest of oil from the primary separator in mid run. This is useful when you want to run at lower temperatures and pressures initially, harvest terpenes from the primary separator vessel, and then resume the extraction at higher temperatures and pressures. Cannabis extract directly out of the CO2 extractor is a thick sticky substance similar in consistency to axel grease or peanut butter and is safe and usable without alterations. There may be small amounts of water and CO2 gas contained within the extract. The gas will dissipate to atmosphere when the extract is gently mixed and moved around on a silicone matt. The water will naturally evaporate. Caution should be taken to not store CO2 extract in a sealed container if it contains water or gaseous CO2. Water mixed with your concentrate for prolonged periods may cause the extract to rancidify. Winterization (aka filtering/dewaxing) - this is the process by which the cannabis extract is filtered, removing unwanted plant lipids and waxes. Approximately 15% of the composition of your extract by weight will be waxes that can be removed without degrading the potency of your extract. Dewaxed extract is also less viscous and, for example, easier to load into a vape cartridge. The extract is diluted in lab grade ethanol in a 10:1 ratio. When the extract is completely dissolved you freeze the solution for 24 hours causing the waxes to solidify. Once in this state the solution can be poured thru filter paper. The filter will retain a solid waxy substance and the residual liquid that passes thru the filter is clearer and has a higher concentration of THC. The ethanol is then evaporated from the solution and you are left with a refined extract that is potent, free of plant waxes, and suitable as a vape liquid. Faster evaporations can be facilitated with the use of a rotary evaporator. Winterization is an indispensable tool in making great concentrates with CO2 extracts. However, it involves lab grade ethanol which can be dangerous to work with. Appropriate safety precautions need to be observed at all times while working with lab grade ethanol. While CO2 extractions are a great way to preserve the flavor of your source material, winterization will cause some flavor degradation as some terpenes are inevitably lost when the ethanol is evaporated off. Pro: faster post processing, your solvent is inert and naturally dissipates to atmosphere - no harmful residues remain, extraction is selective based on temperature/pressure parameters. I hope you found this article to contain useful information and that it will inform your plan when considering establishing an extraction operation.